OrigAudio has been getting air time all over the country from being featured in TIME magazine’s top 100 inventions of 2009, to Fox&Friends News, to a spot on NBC’s Today Show. Now OrigAudio has popped up on the set of Good Day Sacramento. Never before have they actually shown a screenshot of origaudio.com, the e-commerce website that I designed. Check out a screenshot from the video feed on their site or if you want to see the the site in action, go to www.origaudio.com. 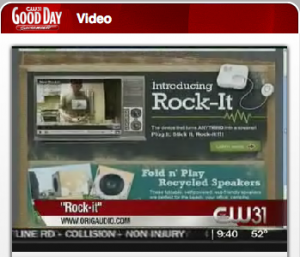 If you would like to watch the whole video segment from Good Day, check it out on the video player on the right. 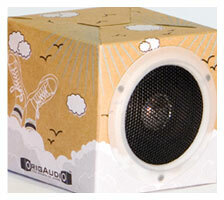 Also, if you are interested in purchasing some hip, affordable speakers, I have designed the DayDream for OrigAudio. These speakers are awesome for travel as they are light, take up no space and work anywhere I have my iPod. Use the promo code: ‘Friends’ to get $6 off your speakers and make sure to tell them that Robi sent you!